MarkLogic json:transform-from-json with multiple namespaces? “Arrow function” in Array.from and forEach does not work in IE 11 it throws a syntax error in the console.how to solve? 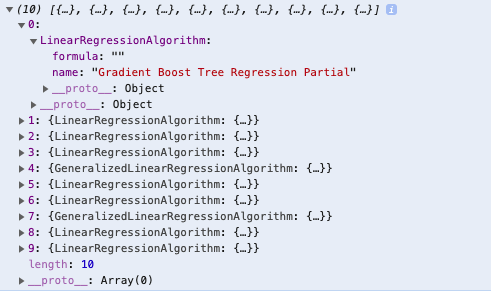 How to convert arrow function into a regular function? In Angular 6, I want to get JSON data (an array of objects) from http://jsonplaceholder.typicode.com/todos and store them to a tempArray. I have done in an arrow function, but after arrow function, tempArray is undefined. For example, when I want to print the first element of tempArray via console.log(), the result is undefined. How should I do this? /// tempArray = data.slice(); If you want to clone recived data. Check this out: How do I return the response from an asynchronous call? My comparing parameter is OrderNo, if order number is same then that object has both finite Qty1 and Qty2. Suppose in first array of object Qty1 exists (greater than 0) but for corresponding OrderNo no Qty2 exists in the 2nd array of object then Qty2 should be 0 in the newly created 3rd array of object. SImilarly for a orderNo, if Qty2 exists (greater than 0) in 2nd array of object but for corresponding OrderNo no Qty1 exists in 1st array of object then Qty2 should be 0 in the newly created 3rd array of object. Also we have to consider that any one of the two array of objects can completely blank array. How can I easily achieve my desired array of object ie. arrayObj3. Can someone provide me a solution in Vanilla JS (without JQuery and Lodash)? Some people are misunderstanding the logic. In first array of object Qty1 exists (greater than 0) but for corresponding OrderNo no Qty2 exists in the 2nd array of object then Qty2 should be 0 in the newly created 3rd array of object. SImilarly for a orderNo, if Qty2 exists (greater than 0) in 2nd array of object but for corresponding OrderNo no Qty1 exists in 1st array of object then Qty2 should be 0 in the newly created 3rd array of object. Also we have to consider that any one of the two array of objects can completely blank array. I have an array called $csv. The header columns are contained within $csv. I have a loop that goes in and overwrites some data in the $csv array starting at index 1. For some reason it is no longer getting any value when I try to output $csv['CRM ID'] even though the value is there when I do a var_export of $csv. 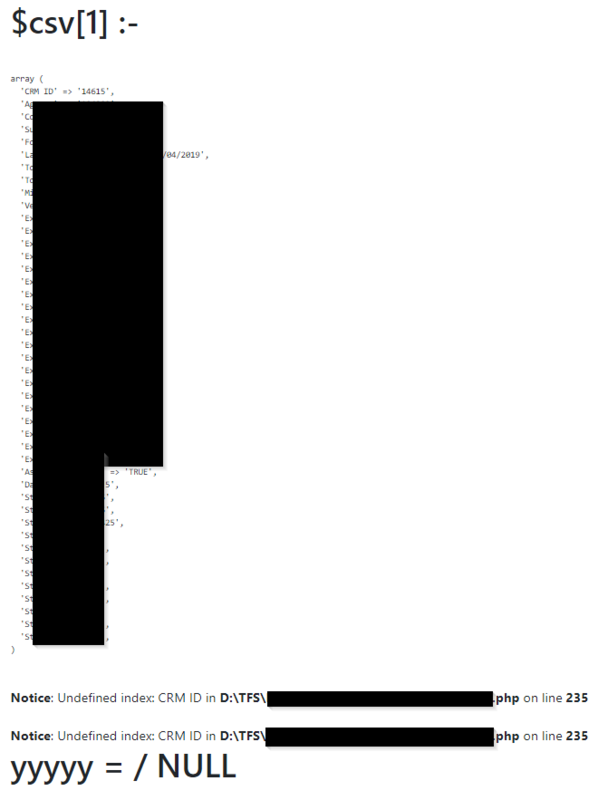 I am able to read data out of $csv['Agency'] just fine. Is it something to do with the space? It has been working up until now until a seemingly unrelated piece of 3rd-party code was changed. I have an Array that is made up of 50 circles and I can get them to display when running the application. I feel like either I have faulty logic when trying to determine the distance between circles or I'm not setting the color properly after making the comparison. This is my MAIN Circle class. One of the assignment requirements was that the circle be its own separate class. This is my main application code which I think is the one harboring the problem in the second for loop? I'm using PrimeNG p-table for display list data. It work fine before, but currently, I start it again and UI have been broken. Have you experience this case ? I have a dropdown, I would like to disable it dynamically, I am using @Input to get the value from the parent component and disable it in the child component. The @input value is returned correctly and triggered on ngOnchange, I've consoled the @input value and it returns as expected. below the codes does not work in IE 11 it throws a syntax error in the console how to fix codes for IE 11? I'm trying to be all cool and modern and use arrow function es6 js but failed at the first attempt. I used to have data factories and controllers to handle API requests in AngularJS, and have been struggling with understanding this for days. I've read a bunch and still don't understand, so please consider that. In my component.ts file, I run the functions on initializing but when I try to console.log from there I get 'undefined'. The pages array of objects and inidividual page object both log from the service correctly. What on earth do I have to do to get the pages array and page object useable from the component file so I can display the data in the html? I know how to do the data binding for the html, but I can't seem to grasp this concept. I have recently started working on angular 7. I am getting a really basic issue with getting the data using http client. Looks like the code calls the rest services but the response body is always empty. I checked the IE developers tool and I can see the request has been made, but it always returns an empty response. I have copied the request URL from the developers tool and tried in Fiddler and that's working and returning the data. Service is returning an array of Objects. I used the type 'any' to make it generic. Otherwise I have to write the same code for each resource. I have put the break point but it never go inside the "subscribe" or "error" method. Any help would be appreciated.